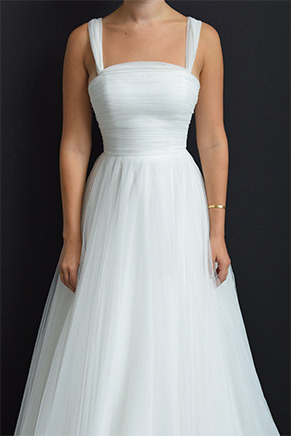 Our Jillian Gown and Ryder Dress have a tulle sash connected to the front of the bodice that lets you create strapless, off-the-shoulder, sleeved, and one-shoulder looks. We’ve found 16 ways to style Jillian and Ryder, but feel free to get creative (we’re sure there are countless more!). you will find four loops—two in front and two in back—sewn into the neckline (the front loops can be hard to see!). Thread the ends of the sash through these loops to create the following looks. 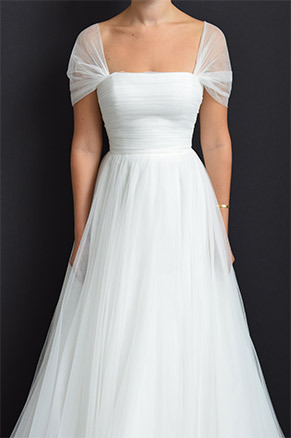 • Gather the sash and wrap it loosely around the top of the bodice. • Thread the right end of the sash down through the back right loop; thread the left end of the sash down through the back left loop. • Secure with a bow. 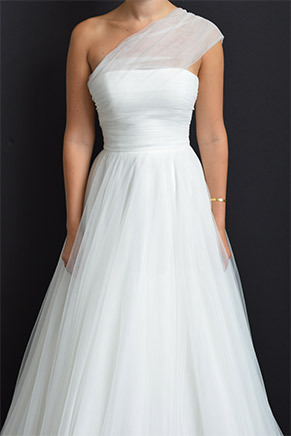 • Keep the tulle loose along the neckline for a soft, romantic look. 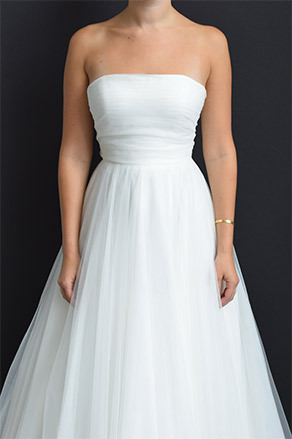 • Tuck the tulle into the bodice for a sleek, straight neckline. 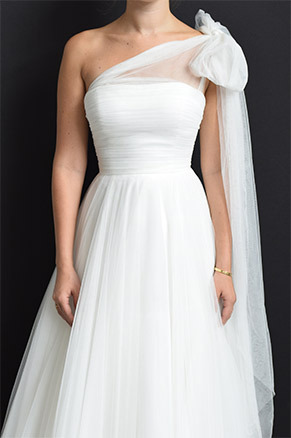 • Start with the sash flat; it should reach vertically from neckline to waistline. 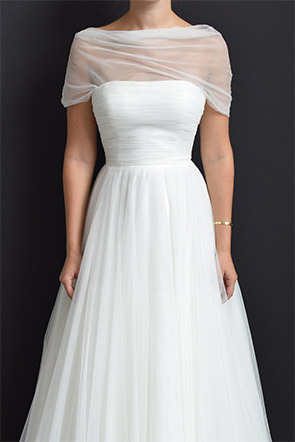 • Wrap the fully-extended sash around the bodice. 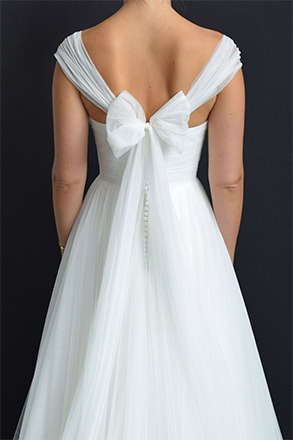 • Secure with a bow at the center of the back. 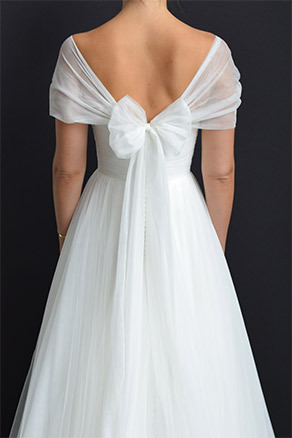 • Cross the sash at the back and wrap it around to the front. 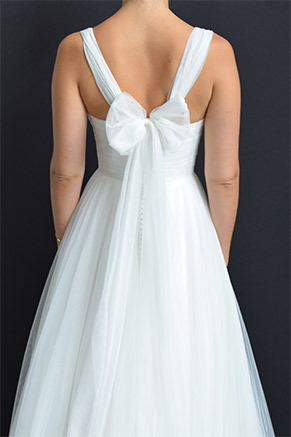 • Secure at the waistline with a bow. 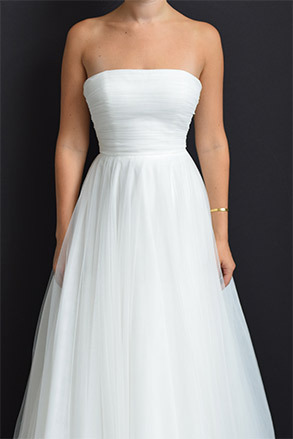 • Loosely gather the sash. 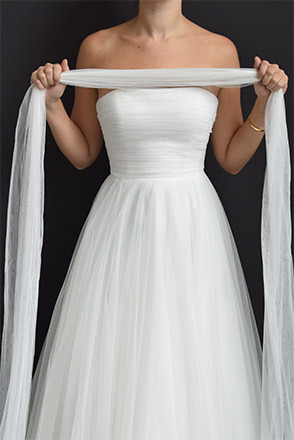 • Wrap the sash around the shoulders. • Thread each end of the sash down through the front loops. 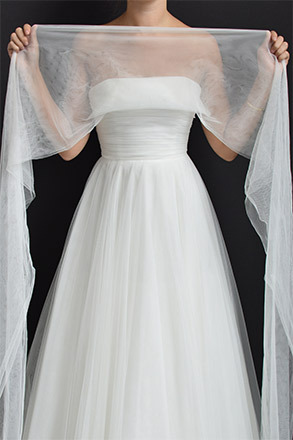 • Drape the sash around the arms. 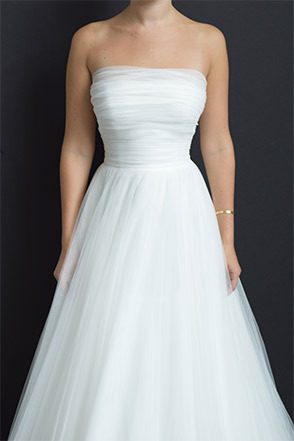 • Keep the tulle loose across the neckline for a soft, romantic look. • Start with the sash flat. 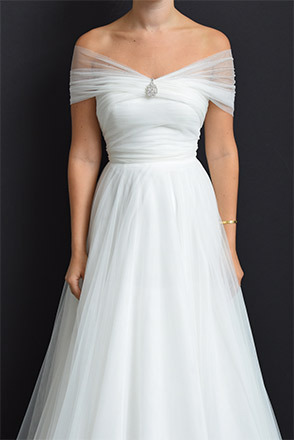 • Place the sash just above the collar bone. • Covering the shoulders, wrap it around the back. • Thread the right end of the sash up through the back right loop; thread the left end of the sash up through the back left loop. • Let each end float down the back. 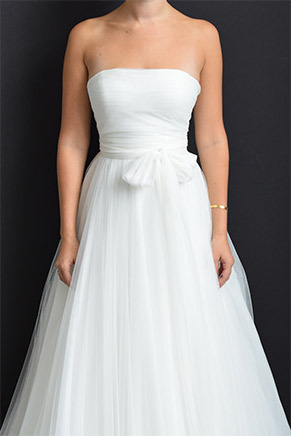 • Place the sash just below the collar bone. • Leaving the shoulders exposed, wrap it around the back. • Place each end over the opposite shoulder. • Thread the right end of the sash up through the back left loop; thread the left end of the sash up through the back right loop. 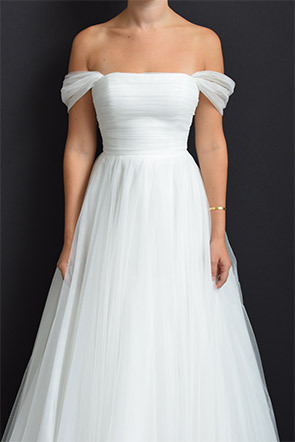 • Gather the sash at the center of the bust and secure with a brooch. • Thread each end of the sash up through the front loops. • Place the sash over the shoulders. 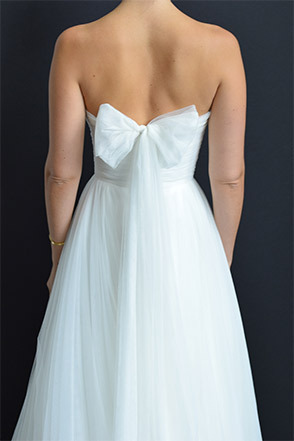 • Spread the straps to the edge of the shoulder to create a slight cap sleeve. 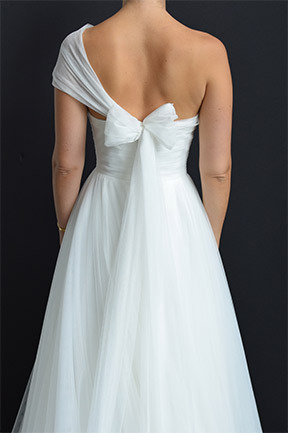 • Spread the straps past the shoulder to create a dramatic cap sleeve. 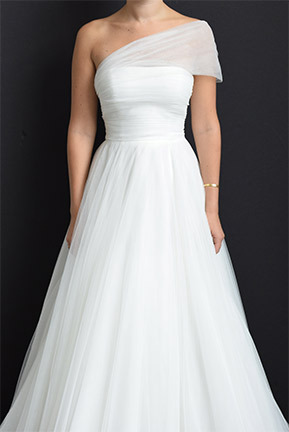 • Place the sash straight over the shoulders. • Wrap the right end of the sash under the right arm and thread it down through the back right loop. • Place the left end of the sash to the top of the left shoulder. 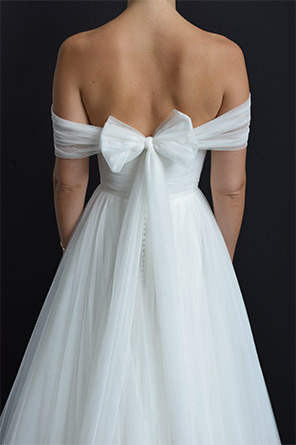 • Secure the two ends with a bow at the top of the left shoulder. • Fold the sash in half lengthwise. 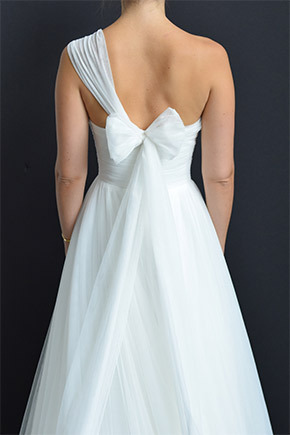 • Drape the left end of the sash over the left shoulder and thread up through the back left loop. 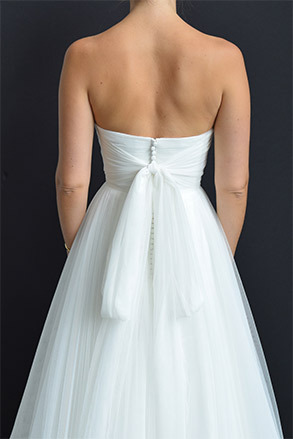 • Wrap the right end of the sash around the bodice and thread up through the back right loop. • Wrap the left end of the sash around the left shoulder and thread up through the back left loop. The content on Resources is our way of introducing you to what inspires us. No celebrity, company, or other brand is endorsing us unless specifically noted.